Most birth defects are sporadic types of birth defects that can involve any organ system: the brain, spine, face, heart, kidneys, extremities, lungs, gastrointestinal tract, etc. These may be either major or minor. In most cases, the cause of the defect cannot be identified but simply reflects the complexity in making humans. Sometimes multiple anomalies may be present and fit the description of a "syndrome". A syndrome is a recognized pattern of birth defects. Fortunately, a detailed fetal scan, when performed by skilled personnel, can detect the vast majority of major birth defects. For example, high quality ultrasound can detect nearly all open spinal defects so that a normal screening ultrasound virtually eliminates the possibility of a significant spinal defect. Major anomalies involving other organ systems can also generally be identified. However, minor defects may remain undetected, however. There are also cetain types of anomalies that develop later in pregnancy and so cannot be detected early. A number of other types of birth defects may not be detected by either routine ultrasound or routine genetic amniocentesis, but can be detected or suspected if special tests are performed. If the condition is common in the general population, all women may be offered the screening test-for example cystic fibrosis. Other types of tests may be offered only to women in certain ethnic groups- for example, Ashkenazim Jews (ones of Eastern European descent) are at increased risk of Tay-Sachs disease, Canavan disease, as well as certain other conditions. Screening for other syndromes or genetic conditions may be offered only if there is a personal or family history of that particular condition. For many other conditions or genetic diseases, prenatal testing may not yet be available. Another important category of birth defects are those caused by chromosome abnormalities. In these cases, we know what causes the birth defects since chromosomes are the "blue prints" or "DNA" who make us what we are. Although the birth defects themselves may be corrected or improved after birth, the underlying chromosome abnormality is always present. Humans have 23 pairs of chromosomes, or 46 total. Some of the major chromosome abnormalities affect the number of chromosomes so there may be too many (the usual case) or too few. 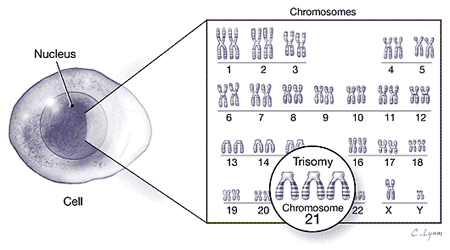 Trisomy 21 (Down syndrome) is one of the most common of the major chromosome abnormalities that may be seen at birth -there are more serious chromosome abnormalities but these may not survive to birth or beyond. In the case of Down syndrome, affected individuals have 3 copies of the 21st chromosome or 47 altogether. Because chromosomes are in nearly every cell of the body, they can affect any organ system. Affected individuals also tend to be mentally delayed. Down syndrome affects approximately 1 in 500 pregnancies in the U.S.
Increasing maternal age is a recognized risk factor for most major chromosome abnormalities. However, maternal age alone is not a good screening test for Down syndrome (click here to see how risk varies with maternal age and gestational age). In the last 2 decades, it has been found that a) ultrasound and b) certain blood markers are better than maternal age alone for detecting chromosome abnormalities. Screening methods have been developed and these continue to evolve and improve. These screening methods help to identify patients who are at the highest risk for fetal chromosome abnormalities and so who might consider diagnostic-but invasive- testing (genetic amniocentesis or chorionic villus sampling).